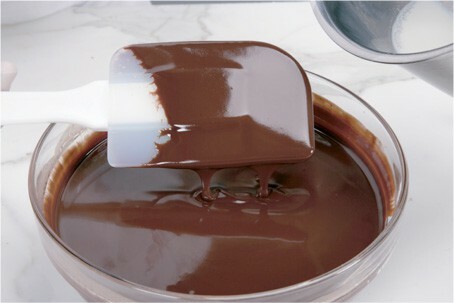 Cream is the most widely used liquid for ganache. Cream contains both butterfat and water, necessary components for the formation of an emulsion. The fat in the cream combines with the cocoa butter in the chocolate, providing a creamy texture and velvety mouthfeel. If the overall percentage of fats is too high, however, the ganache will separate. As a general rule, select cream containing 35 to 40% butterfat for optimum results. Adjustments to ganache formulas may be necessary to achieve the proper balance between fat and water. Cream also contains milk solids and lactose, which add a characteristic dairy flavor to ganache. Scale (measure out) the couverture and heavy cream. For soft and medium ganache, use solid pieces of chocolate. Chop the couverture into ¼-inch pieces and place in a mixing bowl. Small pieces of couverture will melt more easily and thoroughly than larger chunks. For a firm ganache, however, the ratio of couverture to cream will be too high for the heat of the cream to melt all of the couverture, so warm the couverture gently to soften it before adding the cream. To warm it, place the ¼-inch pieces of couverture in the oven or microwave and heat until it is half melted. Heat the cream just to a boil, then remove from the heat. Be careful not to allow the cream to boil, as water will evaporate and concentrate the total amount of fats in the cream. Pour the cream over the couverture in the mixing bowl, immersing the couverture completely in the cream. Set aside undisturbed for 1 or 2 minutes. (Allowing the mixture to rest provides time for the cream to melt all of the solid pieces of couverture and for the mixture to cool slightly.) 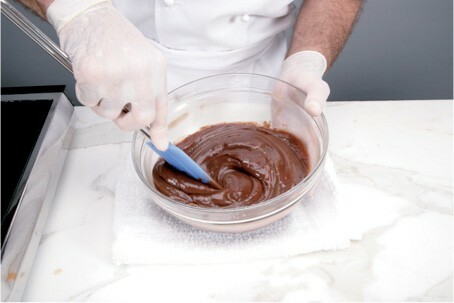 The ideal mixing temperature for ganache is 90 to 110&F/32.2 to 43.3&C (see page 122). 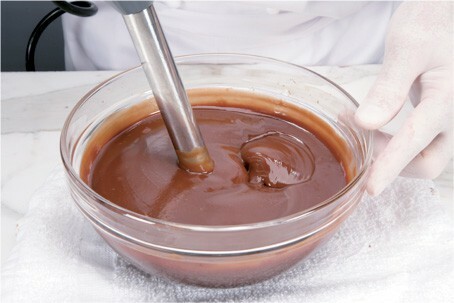 Using a spatula, begin stirring the ganache in small circles starting in the center of the bowl. Stir in wider circles toward the outer edges of the bowl as the emulsion emerges from the unmixed couverture and cream. (Stirring breaks the fats in the cream and couverture into smaller molecules, which then become suspended in the water of the cream.) 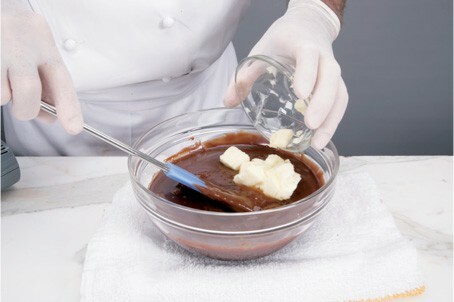 Care should be taken not to incorporate too much air into the mixture during stirring, as air bubbles can introduce bacteria into the ganache and shorten its shelf life. The finished ganache should be smooth and glossy with no visible traces of cream or solid pieces of couverture. If a few solid pieces of couverture remain in the mixture, it can be gently warmed and mixed again to melt all of the pieces. Finish and store the ganache according to its intended use. – For rolled truffles: Pour the ganache into a bowl or hotel pan and cover the surface with plastic wrap. Allow to rest undisturbed at room temperature, ideally 68&F/20.0&C, for a few hours or until firm enough to pipe or scoop and roll. – For filling truffle shells or molded pralines: Cover the surface of the ganache with plastic wrap. Allow to rest undisturbed at room temperature, ideally at 68&F/20.0&C, until the ganache reaches 84&F/28.8&C for white chocolate shells, 86&F/30.0&C for milk chocolate shells, or 88&F/31.1&C for dark chocolate shells. – For piped shapes: Follow the instructions above for ganache for filling truffle shells or molded pralines, but allow the ganache to firm up overnight at room temperature so that it will hold its shape when piped. – For slabbed pralines: Pour the ganache into frames or between metal bars of the desired height and size. Allow to rest undisturbed at room temperature, ideally 68&F/20.0&C, overnight or until firm enough to cut. – Pour cream over the couverture and let sit to melt the couverture. – Stir in small circles from the inside out. 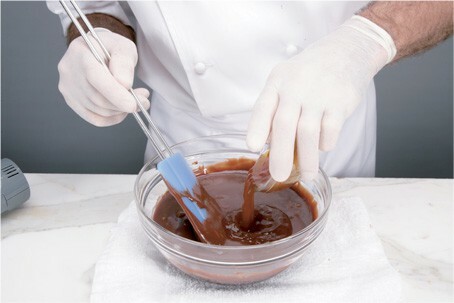 – To avoid the evaporation of alcohol, add the liquor after the ganache has cooled to 94&F/34.4&C. – Add butter to the cooled ganache. – Use an immersion blender to fully incorporate the butter. – The finished ganache should be smooth and shiny. Butter can be added to achieve a better mouth feel and smoother consistency. The quantity of butter used should be 10 percent of the total ganache weight. When adding alcohol to the above formulas, to keep the same consistency listed in the table, add an extra 7.1 oz/200 g cream and 5.3 oz/150 g chocolate. If a sweetener is desired for a dark chocolate ganache because of the bitterness of dark chocolate, fondant is a reasonable choice to use, because it does not contain any hard crystals and the high water content (16 percent) of butter should dissolve the sugar completely. Fondant will also enhance the stability of the ganache. If the fondant is too firm, it can be slightly warmed and softened using simple syrup. The amount of fondant used should not equal more than 50 percent of the quantity of butter. However, the recipes in this book will not contain fondant as a sweetener, as taste preferences have changed over the last decade and most people do not prefer the sweet taste it provides.